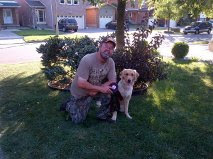 Congratulations to Rob and Willow for earning the first leg of their SHR (Started Hunting Retriever) title at Luther Marsh's one day hunt earlier this month. Willow is officially Tidewaters Celtic Spirit WC from our October Rowan/Leia litter. Great job guys!